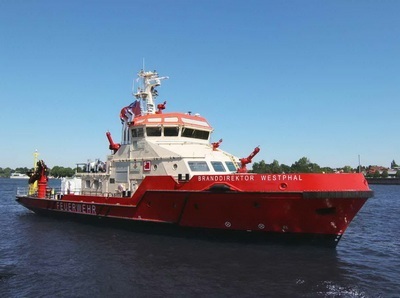 The “Branddirektor Westphal” is powered by two Caterpillar C18 engines, each with an output of 500 kW. Each of the engines drives an azimuthing SCHOTTEL Rudderpropeller type SRP 190 FP with a propeller diameter of 1,350 mm and an input power of 500 kW. This enables the fireboat to reach an open-water speed of 12 knots. In combination with the two Rudderpropellers, two electrically driven Transverse Thrusters of type STT 170, each with a power output of 330 kW, enable optimal manoeuvring and DP capability during firefighting or rescue operations. The new emergency vessel of the Hamburg Fire Brigade is 44.14 metres long and 9.80 metres wide. It has three fire pumps that can spray up to 180 metres or to a height of up to 110 metres. 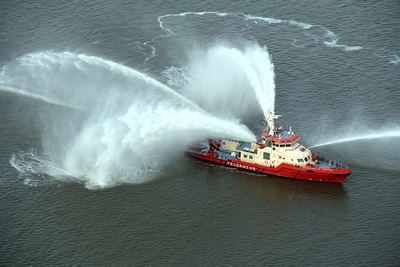 Their pumping capacity of up to 120,000 litres of water per minute is three to four times that of the existing Flotte Hamburg fireboats. The pumps also supply three water cannons and three combined water and foam nozzles. 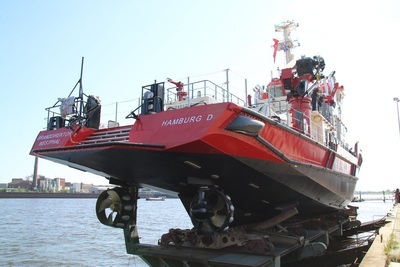 The new emergency vessel of the Hamburg Fire Brigade is 44.14 metres long and 9.80 metres wide. It has three fire pumps that can spray up to 180 metres or to a height of up to 110 metres. The “Branddirektor Westphal” is fitted with two SCHOTTEL Rudderpropellers and two SCHOTTEL Transverse Thrusters. Two SRP 190s and two STT 170s enable maximum manoeuvrability and optimum efficiency. 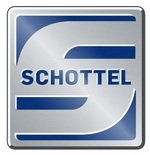 SCHOTTEL - группа инновационных компаний, специализирующихся на разработке, конструировании, производстве и продаже азимутальных движителей и комплексных пропульсивных решений мощностью до 30 МВт для судов всех размеров и типов.